I'm not a spontaneous guy, so for me to do two spontaneous things, out of schedule, in the same week, feels quite liberating! And it is a good reminder that letting myself become too regimented is a sure sign that I'm being pulled too far into the rat race, into the humdrum existence that I've always dreaded. Building a trail and listening to Texas folk-rock are good cures for that. This past weekend, I was in Missouri visiting my grandfather and my parents (mostly the former since the latter then headed south to visit my sisters). Monday morning, I was out hiking at Lake Springfield, on the new Greater Ozarks Audubon Trail. Beautiful, lightly groomed trail, easily traversed. I encountered blue jays, cardinals, carolina chickadees, carolina wrens, tufted titmouses, downy woodpeckers, white-throated sparrows, and a red-headed woodpecker. Got out of the woods into an open grassy area, looked down, and the trail seemed awfully new. Rounded a corner, and it felt like I was in the opposite of Alice's woods in Wonderland: there was a crew, digging up and grading a new trail. They asked me to join, and after demurring for a few minutes, I decided to pitch in for 45 or so. Pulled up dozens of rocks and loosened the soil for a whole 12 feet. Now I'm waiting for the group photo to show up on the Volunteers for Outdoor Missouri website. 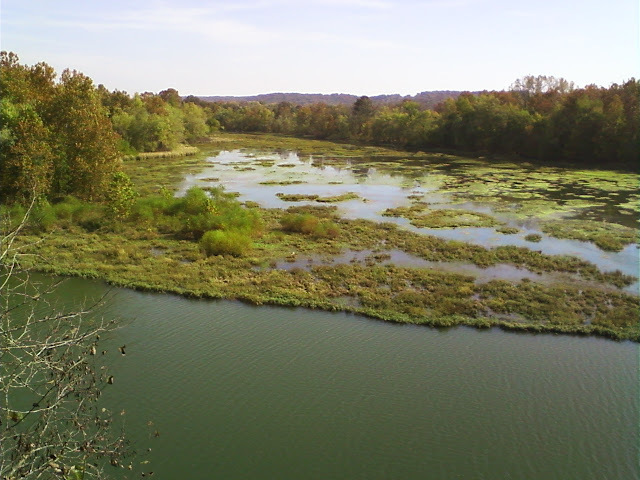 Lake Springfield from the Bluff. More Lake Springfield (and Sequiota Park) Photos. Tonight I was to meet with someone who is interested in learning more about the Baha'i Faith. I suppose we had some kind of miscommunication, as he didn't show. Previously unbeknowst to me, there was to be a concert there that night, with $10 cover. Ended up chatting with the musician for a few minutes, Butch Morgan from Devine, TX. Decided that I should stay and listen to my fellow Texan, very far from my normal sad routine. Good fun songs, folk/rock somewhat in the vein of what Steve Earle or Willie would sound like if you scuffed them up a bit and made them drive to a coffee shop in Minnesota. Good choice: good reward: good songs. He certainly earned my last $10.